An Article from Ken German a former head of the motorcycle unit at the Metropolitan Police’s stolen vehicle squad and now advises bike makers and insurers. It’s now over 75 years ago that Mr D Thomson went to Pride and Clark motorcycles of 158 Stockwell Road in Brixton SW9 and bought himself a new black and chrome BSA 350CC OHV model B26 motorcycle for £49.15 shillings including purchase tax. 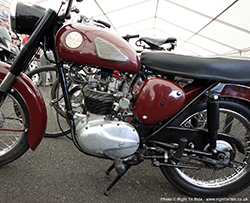 The salesman had told him this model with its silent timing gear and improved tappet construction, four speed foot change gearbox, adjustable saddle and new style knee grips made this 348cc OHV single port machine one of the most popular bikes of the day. A rear carrier (normally13 shillings) was thrown in by the salesman but Thomson had to pay for the pillion seat at an additional eight shillings and sixpence. Thomson recalled as he rode it home that it was definitely a quick bike and after two weeks and a few hundred miles later he realised why. 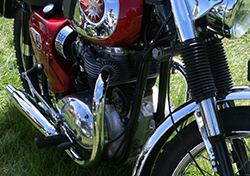 The bike he had purchased turned out to be the more expensive B24 Silver Star model with almost exactly the same specification as the B26 except the B24 had a specially tuned air hardened cylinder, a 20 inch front wheel, a racing twist grip, chromium wheels and valences to the mudguard. The frame numbers were KB24 for both models and KB26 for the engine on the B26. The Silver Stars engine should have started KB24 which was that on Thomson’s bike. He remembered returning to Pride and Clark voluntarily but was told that the salesman concerned had already left their employ. The boss of P&C had realised however what had happened but as the mistake was theirs the extra cost, a whopping £5.2.6d would be waved. Thomson’s small shed would ‘just’ accommodate the length of the bike and he commented that the Silver Star attracted quite a bit of attention wherever he parked it. After all he met and courted his wife riding this good looking machine. Sadly a little over 8 months after he got it, the bike was stolen overnight from his garden shed, the door of which had been forced open. Thomson was of course paid out by his insurance company who he recalled asked little from him regarding the theft and he remembers his annual premium at 3s 2d was not increased. He remembered the police did pop round for a cup of tea, a look at the garage with its forced lock and they gave him his crime number and left. The bike was never recovered but suspicions were held by the officers who attended that it was possibly used in the early bike racing events at the ‘new’ and fairly local Crystal Palace circuit. Thomson later joked that he could identify his bike if it was found as he kept his weekend ‘appointments’ (known then as rubbers) in its tool roll and he also had a couple of girls addresses written on the inside of the toolbox cover. The war put paid to any serious search for the BSA as Thomson joined the Royal Air Force and he never heard anything more from police who understandably had bigger issues to deal with. He was demobbed from the RAF in 1946 and after a visit to a grass track event at Brands Hatch he renewed his love of motorcycling. Shortly after in a rather bazaar visit from the police he was told that his motorcycle had been discovered – in a police storage facility having ‘at some time’ within the previous 5 years been recovered by them. Details offered about the recovery were vague but Thomson was overjoyed rather than annoyed, after all he had moved house as he had been ‘bombed’ out of his last one. The machine he recalls needed more than a quick fettle but with help from Harold Daniels shop in Forest Hill it was repaired and he used the machine continuously until in 1948 when he tried his hand at a ‘new’ racing circuit at Haddenham near Aylesbury. Unfortunately he fell off and hurt himself quite badly forcing him to give up motorcycling altogether. The bike was also in need of repair – again. He sold the machine to my father in 1949 and I helped him restore it (I was only 5). My restoration program consisted of drawing small pictures of animals and tucking them into the handlebars alongside some sweets and insects. In 1950 Dads completed the restoration to his liking but in a matter of months it was stolen for the second time in its life having been lifted over a fence by the thieves from our rear garden into an alleyway during the night. Again the police did pop round for a cup of tea, a look at the garden and alleyway and they gave him his crime number and left. His insurance at £1.11s 6d per annum was he remembers increased slightly. The bike was never recovered. Fast forward 35 years and as a detective at the stolen car squad in the Met I was asked to help local police in Kent to search warehouse premises that had a large quantity of suspected stolen classic car and motorcycle parts. Not an uncommon task for us then as a staggering 587,901 stolen vehicles were recorded on the Police National Computer at that time. Interestingly 372,412 of them have yet to be found. 115’000 of these were motorcycles. During the search and to my amazement I found an early BSA 350cc engine in a box. Unfortunately the numbers on the crankcase had been partially erased. With the help of some retrieval chemicals I managed to reveal a feint impression of the digits KB24-10……. There wasn’t much else around however to help an identification of a similar machine but it did nevertheless encourage me to search high and low for a 20 inch chrome front wheel, a twist grip, mudguards and of course some handlebars. My endeavours however were fruitless and worse the engine number failed to reveal any more digits other than the prefix. Clearly the engine number had been erased at some time for no good reason. As we could not prove that the engine was stolen the court ruled that the thief should be allowed to keep it. It was after all 35 years after the theft and the suspect was only 43 years of age. He clearly knew the value of the engine however and he was rightly found guilty of the theft of 18 stolen machines, 4 cars, and a few quads plus some ride on lawn mowers. In the UK we are pretty lucky and have a stated case that specifies that ‘you cannot pass title to property that you do not own’. In essence if you have had it stolen from you then ‘Title’ has not been passed and you still own it. You do need to prove ownership however and if you want to ensure your bike or any part of it remains indisputably yours throughout its existence then you need to put your mark on it in as many places as possible. I often wonder just what happened to my fathers Silver Star and should anyone reading this feel inclined to look into any handlebars they have and they find some drawings, sweets or dead insects merely for interest sake please let me know. Also if you do find some ‘rubber’ items in a tool roll, I can merely for interest let my cousin Sylvia know (she was Thomson’s daughter and he was my uncle). After all she may not have been born at all if his bike hadn’t been stolen! 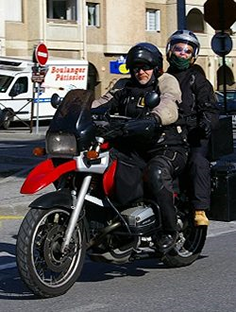 There are various marking systems available on the market including the MASTER Security Scheme (Motorcycle and Scooter Tagged Equipment Register). 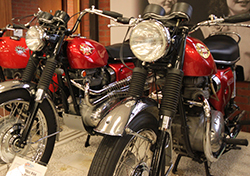 The scheme was initially supported by major manufacturers BMW, Honda, Kawasaki, Suzuki, Triumph and Yamaha, with other manufacturers expected to follow, which now includes KTM.